Fresh Tomato Supplier In Gujarat - Get Best Deal! Keeping a full track of the prevailing developments in the market, we put the best of our endeavors in providing our clients with high-quality tomatoes at the utmost cost-effective rates. We are furnished with temperature controlled warehousing facility which is fortified with the best-in-class racks and refrigerators to keep the tomatoes fresh for a longer duration. We make sure that none of the pieces is rotten or inept. 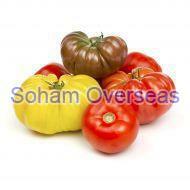 Soham Overseas is regarded as one of the most remarkable fresh tomato suppliers in Gujarat. We are well-equipped with trucks and other transportation facilities to suffice the requirements of the far-flung clients. So, the interested clients can contact us via e-mail or phone to acquire an authentic assortment of fresh tomatoes.